Author note: If you have a tree nut allergy, substitute the coconut oil with canola oil. Feel free to substitute the chicken thighs with chicken breasts, but keep in mind the cooking time will need to be reduced by a few minutes to prevent overcooking the chicken breast. Rinse the rice and set aside. Add the coconut oil to the pressure cooker and using the sauté feature, sauté the onions and rice for 4-5 minutes. Stir occasionally to prevent browning. Add the chicken stock, chicken thighs and salt to the onions and rice. Stir well to combine. Secure the lid to the pressure cooker. Pressure cook on high for 20 minutes (if using the Instant Pot, use the “soup” feature). After 20 minutes cook time, quick release the pressure. Remove the chicken from the pressure cooker and set on a rimmed cutting board. Let cool. 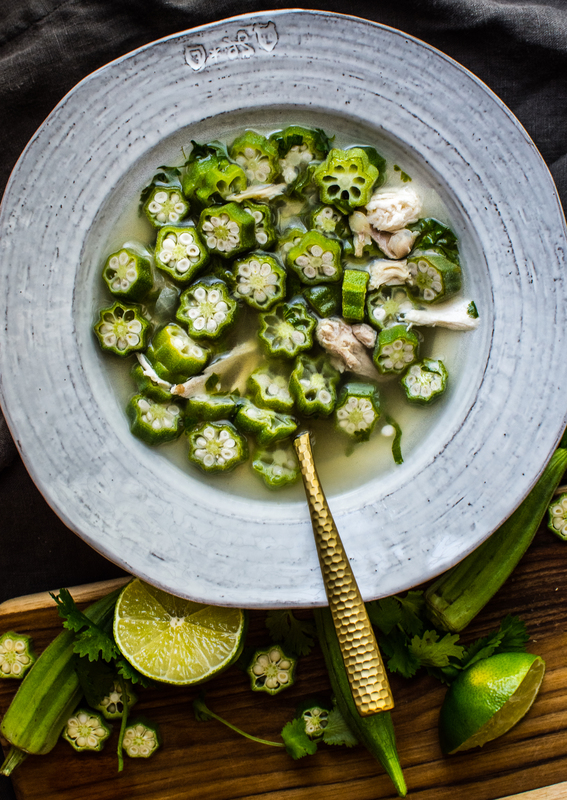 Place the okra into the soup and cook for 8-10 minutes using the sauté feature. While the okra is cooking, remove the chicken from the bone. Chop the chicken meat and add back into the soup. Add lime juice and cilantro to the soup. Heat through. This entry was tagged A Pleasant Little Kitchen Instant Pot Okra and Chicken soup, A Pleasant Little Kitchen Instant pot recipe, A Pleasant Little Kitchen Okra and Rice Chicken Soup, A Pleasant Little Kitchen okra recipes, dallas food blog, dallas food blogger, Instant Pot Chicken and Okra Soup, Instant Pot Chicken Soup, Instant Pot Okra and Chicken Soup, Okra and Rice Chicken Soup, okra recipes. Bookmark the permalink.